As art historians it is built into our DNA to prize the beautiful, but as I continue to integrate digital analytic tools into my research I am choosing to embrace the mess. 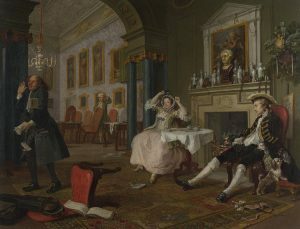 William Hogarth’s satirical depiction of a messy, high society marriage – The Tête à Tête from Marriage A-la-Mode. Throughout my five years of exploring and working in digital humanities my priorities in digital art history have transformed from an emphasis on creating elegant visualizations to valuing the analytical capabilities of digital tools. Digital Art History is an expansive term. It can encompass even the transition from slide projectors to PowerPoint in the classroom that occurred almost two decades ago, an event which I witnessed as an undergrad. Even in something as simple as the conversion to digital presentation programs art historians have put a great deal of their labor into the aesthetics. Undoubtedly, as a discipline art history has a particular emphasis on the visual that is almost unique in the humanities, but is that what should define the digital trajectory of our field? The field’s visual predilection has fostered innovative platforms and experiences that invite viewers to explore artworks in deeper and different ways. One can think of the exemplary Bosch Project and Closer to Van Eyck, both of which provide the opportunity to compare different technical images of a single painting in different ways. Another pioneering visual solution was Harvard Art Museum’s reconstitution of their Rothkos through digital projections. The exploitation of digital tools in these projects are successful because the attention to the visual offers an inroad to exploring different aspects of art history to many publics (not just scholars). Yet, for researchers, digital humanities can provide more than the razzle dazzle, public display of their results. Through a computer-readable, robust catalogue raisonné an art historian can map the movement of objects, visualize statistical variances, etc. Digital reconstructions of long gone or modified spaces can concretize a scholar’s understanding of how people moved and interacted with architecture and objects. The potential of using analytics to understand art are really just beginning to be exploited by researchers. From my experience, these research driven analytics often result in ugly visuals, gobbledygook to all but their creator. But “thinking with digital processes” does not need to be aesthetically compelling to be useful. (Drucker 7) Although I study an artist known for his emphasis on beauty, it is in the mess where I have done my best digital art history work. My project’s ugliest maps and visualizations have answered dissertation questions I didn’t even know needed to be answered. However, when I present my research, I often sense the audience’s disappointment in my graphs’, charts’, and maps’ lack of allure. I am learning to be ok with this. Because when digital art history is used as a method, a part of the embedded practice of a scholar, the visualizations and maps have an audience of one. They are part of the discovery process and are not truly intended to entice the public. Johanna Drucker “Is There a “Digital” Art History?” Visual Resources (2013) 29:1-2, 5-13.